It has been a very busy week, full of new things and excitement. 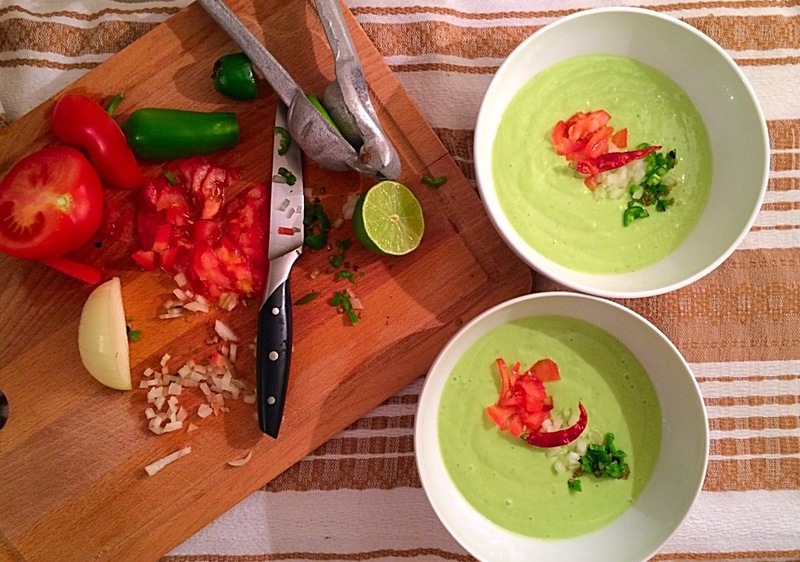 Today’s recipe is inspired by a lovely gazpacho I had yesterday during a talk about health by the lovely women from “fig and bloom”, Dorothy, the chef of the group, cooked this refreshing gazpacho soup with cucumber, avocado and jalapeños, so I thought I’d make my own version with a Mexican twist. This is a Mexican soup, very popular in central Mexico, it’s usually very good to have as a little hors d’oeuvres or a quick light lunch. It is commonly prepared with cream, but I use low fat Greek yoghurt and the texture is the same. The best thing is that it takes no time to prepare and it is delicious. Char grill on the hob burner the peppers, once their skin is blackened, put them in a plastic bag. After 10 min, remove the black skin and rinse, so they get cold, chop and keep aside. Put the avocado, peppers, juice of one lime, onion, salt, pepper, water and yoghurt in a blender and blend until getting a very smooth consistency. Taste and add more salt or lime if necessary. Serve in a small bowl or glass and garnish with tomato, onion and jalapeño chilli.